As a French city that only officially became French in 1860, there is something unmistakable about the mélange (hey, when in France!) of cultural influences so evident in Nice – from its eclectic building styles to its people and cuisine. The Belle Epoque architecture of the mansions along the Promenade des Anglais – suffused with the sensibilities of their English architects – engages in a tug-of-war with the Italian flair of the buildings lining the narrow streets of Vieille Ville in the old town. French Riviera glamour is offset by the natural, rugged terrain surrounding the city, which has been cherished by centuries of artists, including Matisse and Chagall. And the cuisine…mon dieu! Every layer of this city reveals something new and surprising, so what better way to explore Nice than through the experiences of those who have lived in this extraordinary city? The home of Restaurant JAN strikes something of a chord with my other hometown of Cape Town. The mountainous topography breaks up the structured urban landscape, creating multiple vantage points from which to soak up the scenery, which ranges from breathtaking vistas of the Baie des Anges to elevated views of Nice’s many boulevards and promenades. And as a port city, Nice is home to a colourful mix of people from far and wide – whether recently arrived or part of the furniture. The noon gun gets me every day at 12, just when I'm about to take a bite of my daily religious baguette with so much butter on it that you can see your teeth marks after each bite. I'm a sceptical coffee drinker in France. As I always say, "You leave some things for the experts" (in a nice way). I refer, of course, to the Italians. There are so many good places to grab something quick, but what I found incredible is that when you get to know the people who make them, it tastes even better. This reminds me of a friend who once said, "I can't cook for strangers." Quite the statement to chew on when all you do is cook for strangers, but what it is and how special it is to get to know your grumpy veg dealer better and, ironically, how much nicer he becomes if you give him a stark look back on occasion and offer him a biltong lamington - just to try it - and hearing him tell you how he loves South African food, makes it all worthwhile. When I arrived in Nice I was a cheeky foreigner who thought I could speak fluent French with only 5 words in my vocabulary. (Come on! It can't be that difficult with all the pouting and oh la las) Then I realised, my life here would only become meaningful (and real connections can only be made) once you immerse yourself in the two million cigarette buds on the pavements, the "le chien poo-poo" that no one really cares to pick up and the tonnes of furniture that get thrown out of apartments on a daily basis (which, by the way, is one of my favourite things about Nice, as I have an absolute addiction to old and used things). But in between all of this, the big old church bells ring on the hour and everything is fine again. It's like a reset button to make you realise that you are in one of the world's most beautiful cities. So over the nearly seven years of slowly becoming Niçoise (which I think will take another seven), I have realised that you have to create your own village. You have to find your boulanger, your fruit et legumerie, poissonnerie, le coiffeur that makes you feel like a million dollars, your whiskey shop and the fromagerie, wine cave and your favourite café or bistrot where you can stop and have a short glass of red after a busy service. The monsieur that you buy your rotisserie chicken from and the patisserie where you know you get the perfect flan. The longer you stay in Nice, the more of these fascinating souls you meet – and the more people, places and perspectives you discover. Having a restaurant in Nice also means that people find you – and whether they are here to stay or are simply passing through, they each discover something new about this city that you never knew was there. I asked a few of my colleagues and friends to also list their favourite spots. Rutger is my head chef, he keeps a close eye on JAN with me, a man with class and calmness. Michael, our Maître d'Hôtel, has a fine palate for wines and the finer things in life. Sophie is our assistant Maître d'Hôtel and makes sure everything is in place like no other person can. She is also part Italian, which explains her beautiful olive skin. Cora is a Dutch expat friend, whom I met through her sister, Jeanette, in Apricale. She lived in Nice for years. Loïc is an entrepreneur who was born in Nice but works as an investment specialist in Monaco, and Anthony is one of the top photographers the Côte d'Azur has to offer. Lianne, manager of guest relations at JAN, is connected to every hot spot this city has and also really enjoys the finer things in life. These are some of our favourite places in Nice. French wine needs no introduction, but moreover, Nice boasts a wealth of top Mediterranean wineries on its very doorstep. The vineyards along the Côtes de Provence have been producing wines for over 2300 years, including Syrah, Grenache, Mourvedre and Cabernet Sauvignon red varieties and among the white; Rolle, Ugni Blanc, Clairette and Semillon. But when a trip to the vineyards is not on the cards, where do you get your wine? “Les Grande Caves Caprioglio,” says Cora. “I love finding those special little places where time stands still.” Situated on the rue de la Préfecture in Nice’s old town, Les Grande Caves was established in 1910 and has been owned by the same family for four generations. Apart from their huge array of wines to suit any budget, they also stock around forty different organic wines and pride themselves on being proficient in German, English, French and Italian. In rue Lascaris next to JAN has a small wine bar called BiBoViNo where some of the largest and well-known wineries in France put their wine in the box. Yes, I know... but it keeps longer and you can have more of it over the summer months without having to worry about a bottle breaking on the beach. High quality wines and a lovely atmosphere to also enjoy a glass with a plate of cold meats and fresh bread. Close to Place Garibaldi (which is great for people watching) is the wine and liquor shop Aperitiv. Friendly staff with a wide selection of amazing wines, spirits and beers. They also have a deli section with a variety of local olives. You have not been to Nice if you haven't been to the Cours Selaya Market. Walking distance from almost anywhere in Nice. Early Tuesday to Sunday mornings until noon. Seasonal driven which is the only way the local's eat. Fantastic!!! 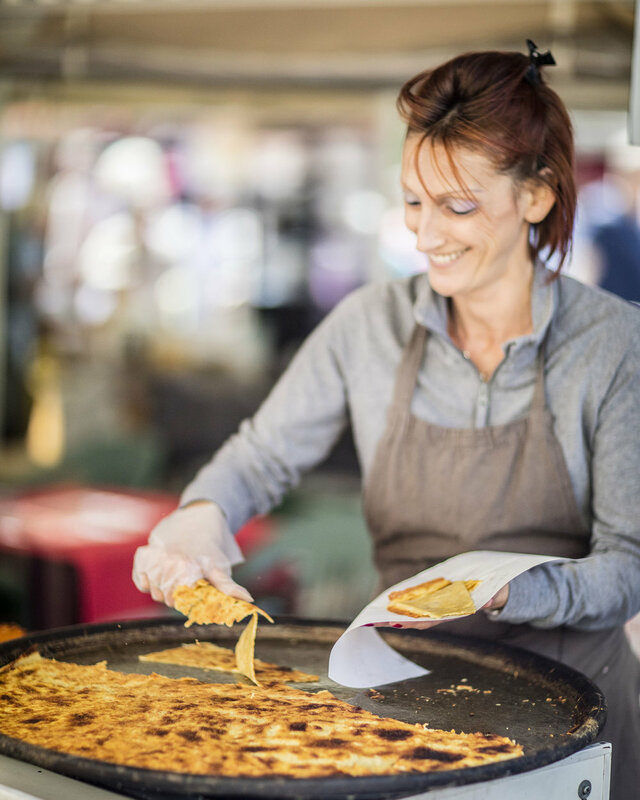 Socca (chickpea pancakes), typically from Nice, is where it all starts. 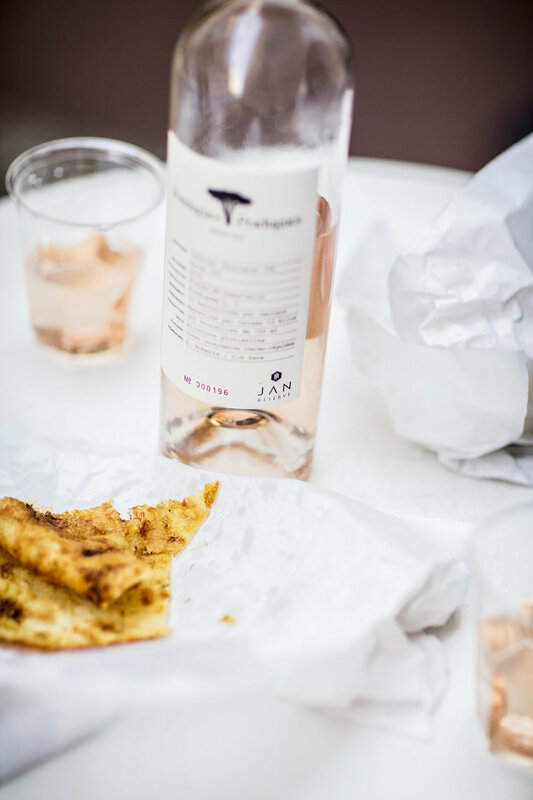 Head off to the Cours Selaya Market in the old town of Nice for fresh Socca from the oven where small producers from the Alpine foothills bring in a bounty of produce daily, except Mondays. There you must also try pissaladiére or tourte de blettes (chard, raisin and pine nut pie). Someone who can really indulge you on a market tour (and also do incredible cooking lessons) is my friend Rosa from Le Petit Farcis (I designed her website logo a few years ago and from there we were connected as foodie friends) Her knowledge about the local food scene is incredible and her cooking classes, lots of fun! Just down the road from JAN is Chez Pipo where you can have an entire meal – mostly Socca for small change. A glass of rose is "obligatoire" and the service is fast and to the point. New on the block and already a favourite of mine is Les Agitateurs in the Port District of Nice, 24 Rue Bonaparte. Delicious light meals with mediterranean dishes like apricots, almonds and Amaretto sabayon. Watch this space! A sucker for atmosphere, Rutger’s favourite bistro is Bistrot d’Antoine on rue de la Préfecture. “Good food,” he says succinctly, “The menu is seasonal and they support local producers. It’s in the heart of the old town, so it’s got a lot of French charm.” Make sure to book in advance. We have to be biased and say JAN, 12 Rue Lascaris for a intimate, romantic dining experience. South-African flavours with French local produce. There are only 10 tables, so book well in advance on our website or try to pop in over lunch on Friday and Saturday to see if we have a table available on the terrace. Provençal-style Olive et Artichaut in the old town is always bustling with local suppliers filling the plates with beautiful local ingredients. Make sure to book. La Cave de la Tour, an authentically French wine cellar and bistro. “They make authentic, local bistro food served with an excellent glass of local wine. It’s also frequented by chefs and restaurant owners,” she says, adding, “Everyone knows each other. They also organise farçis niçoise competitions – a Niçoise stuffed-vegetable speciality.” says Sophie. “Be sure to visit La Cave around 4 or 5 pm, when the most magnificent sunbeams filter through the windows, reflecting off your wine glass,” adds Lianne. Two brothers dedicated to fine dining is Flaveur, beautiful dishes with interludes of detailed plates and an amazing wine list. This restaurant is also very small and needs booking in advance. Make a whole evening of it. Also in the old town of Nice is Le Panier, a great lunch or dinner spot with delicious seasonal food. There are only a few tables on the street and those are my favourite. Acchiardo is a traditional, neighbourhood restaurant that has been in the same family since 1927. Dishes like red mullet, olive tapenade and tiramisu are their speciality. Situated in a lovely area called Place du Pin is a restaurant perfect for a light lunch, Magnolia Café serves fresh delicious salads. 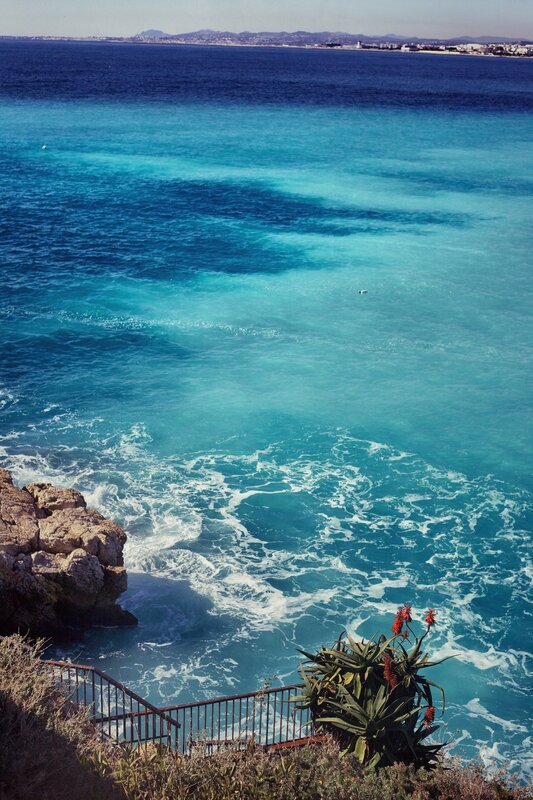 Le Plongeoir occupies an iconic place in Nice, as it hovers above the sea on the famous pillar of rock and the diving boards themselves, The setting is unusual and steeped in history. Their cuisine has a strong Mediterranean influence. “Nicolas Alziari established the most important olive-growing field in France in 1868 and the family opened a shop in Old Nice in 1932,” Lianne adds. “Every day the oil from the mill was brought down on horseback to supply the tin-iron drums of the little shop.” Alziari also sells an array of jams, honeys, syrups, beauty products and gifts. Two minutes away from my apartment is Maison Jean Marc Bordennat Boulangerie on 19 Rue Barla. Nominated for having the best baguette in France, this family-run bakery long ferments their breads and also makes incredible apple pies. Early mornings are the best time to go but be prepared to queue. Also, have some coins ready, as most boulangeries have coin machines nowadays that are situated right in front of the counter. 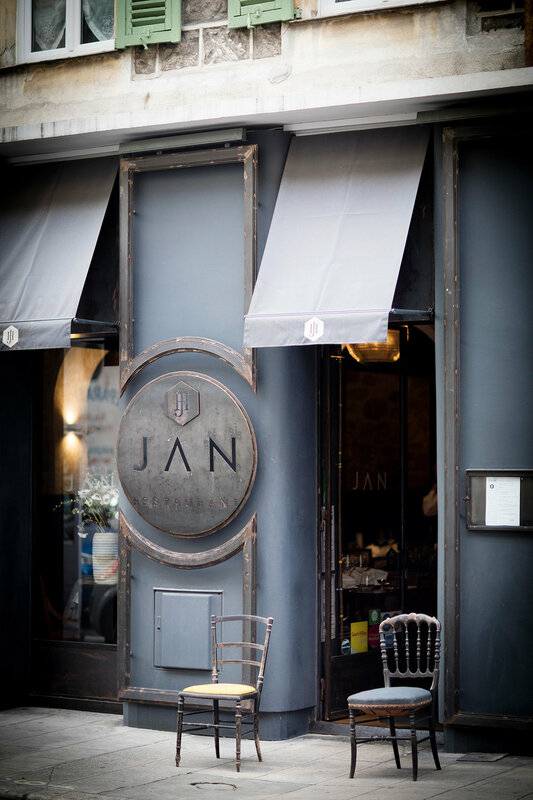 The staff at JAN have one place we constantly go to for breaks: Boulangerie Maritime, “the breads are good, but the croissants are the best in Nice,” says Rutger. With a few shops scattered across Nice, Patisserie Lac do consistently good cakes, sweets and macarons. They're cakes are small and the portions are perfect for packing in a picnic basket for a day at the beach. Deli Bo, a corner café, beach club and pastry shop, serves fresh salads and good snacks for an on-the-go meal. Neapolitan pizza is clearly de rigeur in Nice, as it also makes the top of Rutger’s list. “My favourite is Made in Sud,” he says of this authentic, family-owned Italian pizzeria on Boulevard Stalingrad. Life in France would not be complete without a little l’amour, although you don’t have to be in love to buy flowers. Nice is a great place for flowers, but a few florists stand out. Martin Fleurs always has fresh flowers and fresh ideas, they make great bouquet suggestions. ‘Less is more’ is their credo and they are super kind. Whether perched on a hill overlooking the bay or hidden in a side street in the old town, one is spoiled for choice when it comes to bar-hopping in Nice. So, where to begin? One of my favourite atmospheric spots is Les Distilleries Idéales in the old town; great for a local wine by the glass, or a beer on tap. I love the Cherry beer and it's always packed until late. Happy hour is from 6pm to 8pm. As Cora also mentions, it is a little "un-French" but the fan system in the roof alone is worth going to see. “My favourite bar in Nice is the Old Sport Club,” says old sport, Anthony. “It’s the only bar in Nice with a real cocktail bar in the classic speakeasy mode.” Indeed, with its modern take on the US Prohibition era of the roaring 20s, the Old Sport Club gives off serious Gatsby vibes and is the perfect place for some sophisticated escapism. Always the life of the party, Sophie takes the tempo up a notch. “The Bolybar is a funky little bar in the old town,” she says. “Sylvain, the owner, is a big fan of electronic music and often invites great DJs to play. It’s also a great place to enjoy a glass of wine or beer with friends. And on the terrace, you can really feel the bohemian ambience of the old town. No city in France has a shortage of cheese, but a cheese shop is like a friend. The relationship you forge with your local fromagerie is very personal. And as with all things artisanal, a recommendation is very much a part of the experience. Lou Froumaï – not only for the convenience of its location, but also for their extensive range and quality. La cave a fromage Chez Jean Luc in 42 Rue Bonaparte supplies Restaurant JAN. He has a beautiful selection of cheese, cream and butter which is simply as good as it gets. Mindful living as a lifestyle has grown in recent years. In the past, followers of this lifestyle have often endured such off-handed descriptions as “dry muesli” and “granola” to pigeonhole them, but caring about where the ingredients we eat come from has moved way beyond a trend. Without hesitation, we will point you to TOC, situated close to Place Saint-Francois – not only for its range, but for its guarantee of quality. Coffee can be a struggle in the South of France. As we are so close to Italy there is just somehow a shortage of good coffees here. Saying that, there are a few spots that are right up our alley! Anthony, on the other hand, fires off a string of favourite cafés. “Marinette in Vieux-Nice for its great coffee and indemoulable cake (a cooked chocolate mousse cake). Café Paulette in Place du Pins for the view and the ballet of people constantly passing by…the coffee’s also good,” he says. Unsurprisingly, Paulette’s is also the café he goes for some quiet contemplation while still around people. Ballet optional. What impresses Sophie is a café that does it all. “At Cafés Indien they make amazing coffee that they toast themselves and sell to the public,” she says. “The owner is a passionate, certified barista and the selection of different coffee beans, ground coffee and teas is fantastic! "Then there’s this place that’s not actually an authentic coffee shop, but it’s a magic little spot where you can dream and write. Le café du musée is the Chagall Museum’s little restaurant or brasserie and is located in the Cimiez area. The restaurant is in the middle of the museum’s garden, where it just feels like time has come to a standstill." The workhouse café on 64 Boulevard Risso is a gathering place for on the move entrepreneurs and with the great coffee there is also lovely lunch and breakfasts. If you are looking for a place close to the point of the Promenade that is tucked away, but where you can still enjoy the beautiful views of the rest of the coastline, it is Castel Plage. It's a private beach club where you can rent a beach chair and lounge for the day with service and drinks on the side. In the heart of the Port district is a Puces de Nice right off Rue Robilant. This is selected fine vintage but sometimes comes at a hefty price. It's a lovely space and the vintage pieces are displayed right on the port. For anyone who has a chandelier fetish like I have, you must visit Max at his Loft Galerie, 2 rue Saint Suaire. He's a good old friend of mine and his place is situated right at the start of the Cours Selaya. His shop has over 200 chandeliers, each restored by himself, from Baccarat to Christoffle. One of my favourite places for old things is Trocazur, 23 Rue Scaliero. Locals go there to get rid of their antique furniture and porcelain - and you can pick up a real bargain. Rosie and Pascal are my adopted parents in Nice and I visit them about five times a week. In the same street as JAN there is the lovely Au Bonheur des Cocottes at 19 Rue Lascaris. Very well curated pieces from the 20s, 30s and 40s. At a beautiful small shop at 6 rue Bonaparte right on Place du Pin you will find the best handmade Italian shoes curated by Lucien Chausseur. My Favourite!